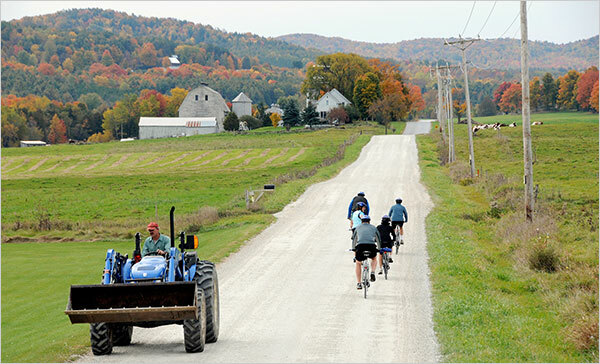 Nestled between Lake Champlain and the Adirondacks to the west and the spine of the Green Mountains to the east, Addison County is a fertile breadbasket chockfull of dairy farms, vegetable stands, apple orchards, and green fields as far as the eye can see. Bike through the heart of this bucolic slice of pie on backcountry roads that sweep up and down ridges and you’ll be rewarded with vistas in all directions. The spectacular scenery is enhanced in the fall when the maples offer the best of Mother Nature’s light show. If you want a local to design your route based on mileage, go on a self-guided bike tour with Country Inns Along the Trail. They’ll create a detailed map, shuttle luggage from one inn to the next, rent bikes, and help out in case of emergency. This is wonderful news for New Yorkers who can take the Amtrak train from Penn Station and five hours later be at the small Ticonderoga Station, a 6-minute ferry ride across Lake Champlain from Addison County. Country Inns Along the Trail can drop off your bikes, take your luggage, and off you go. Try to include the Shoreham Inn in your itinerary. Built in 1790 as a country inn, this post-and-beam house is now home to a gastropub manned by an excellent Irish chef, Dominic. They also serve Switchback Ale on tap, one of the many reasons why it’s become a favorite stopover for bikers.